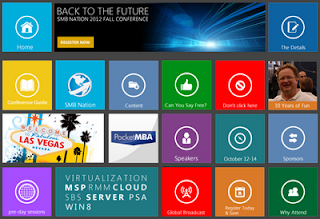 Small Biz Thoughts by Karl W. Palachuk: Final Podcasts from SMB Nation: On To The Future We Go! Final Podcasts from SMB Nation: On To The Future We Go! I posted the last two interviews from SMB Nation over at the SMB Community Podcast blog. One is from my man Mike Bayless. Mike gives a good summary of the content and networking from an attendee's perspective. The other is a longer interview with Tom Poole (CEO, Cloud Nation) on what they're up to and the big announcements you'll see on November 1st, December 1st, and January 1st.